Poor orphaned Bumble-Ardy has never had a birthday party. In this rhyming story, Bumble-Ardy's Aunt Adeline takes him in. After receiving a cowboy costume as a gift, Bumble-Ardy decides to throw a party on his own while his aunt is out - a party that quickly gets out of control. As the costumed swine begin to "oink loud grunts" and pull "all kinds of dirty stunts", readers are treated to several nearly wordless pages of rampaging pigs, a là the wild rumpus of Where the Wild Things Are. The masks the pigs wear look scary, strange and like something out of Mardi Gras. There's something vaguely menacing about this story - I certainly felt uncomfortable with a few things. I didn't like the pig dressed as an Indian with a feathered headband. 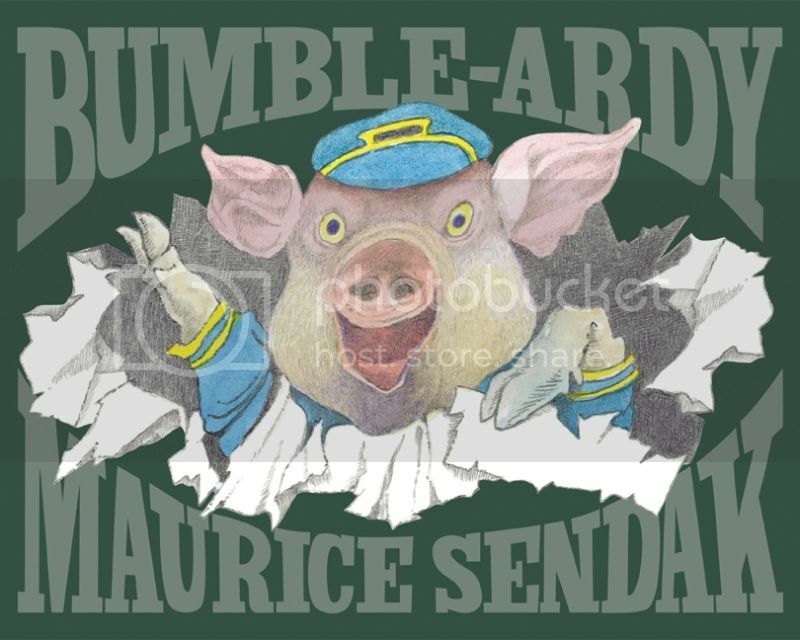 Bumble-Ardy is dressed as a cowboy, and many pages, including the cover, feature a pig dressed as a police officer. What's Sendak's message here? As I read this new Sendak book, something tickled the back of my brain... the story, especially the repeating line of "half-past nine" just seemed so familiar. Was it something from Sesame Street? Yes! Yes it is. I thought it was interesting that the boy from the original story becomes a pig in this version. Despite changing the wine that was guzzled to brine in this new offering, Bumble-Ardy is still sure to raise the hackles of concerned parents. The fact that Adeline is not his mother in this version, but rather his adoptive aunt, certainly raises the stakes. I think the emotional intensity of children is very well respected here. How many children feel put-upon when a birthday party isn't as grand as they hope? A year ago feels so long ago to a child that it may as well have not even happened. Even a long-anticipated party can feel overwhelming to a young child who will break down when overstimulated. When Adeline comes home and discovers the house a complete mess, she becomes so enraged, her whole face distorts into a blackened mask of fury. Reading the book for the first time, I missed the final page. I initially thought it ended at "Okay smarty you've had your party! But never again!" and a tearful Bumble-Ardy responds, "I promise! I swear! I won't ever turn ten!" Happily, the story doesn't end there. There's one more page, a reconciliation of sorts when true to the original "Adeline, that aunt divine,/Took in her Bumble valentine/And kissed nine times over nine." A rich and challenging entry into the genre of picture books offering assurances of unconditional parental love, this is a fine addition to Sendak's oeuvre. Be fearless and give this book a chance - children may be able to handle more than you think.